The "Do Something" section of Conejo Valley Guide highlights over 250 things to do throughout Ventura County and surrounding areas, including over four dozen museums. Let's take a closer look at the museums on the list that offer free admission days. The information below of course is subject to change, so be sure to contact the museums first to confirm. Admission to the Conejo Valley Art Museum is free year-round. There is no admission charge at the Skateboarding Hall of Fame and Museum that opened at the Simi Valley Town Center in December 2018 (massive collection of vintage skateboards and skating artifacts). Open (as of January 2019) Thursday/Friday 2-9PM, Saturday 10AM-9PM and Sunday 11AM-7PM. The Santa Susana Depot and Museum in Simi Valley is open to the public on weekends, free of charge. Historic Dudley House Museum in Ventura is open the 1st Sunday of the month most of the year and admission is free (donations encouraged). Robert J. Lagomarsino Visitor Center at Channel Islands National Park located at the Ventura Harbor is open year-round free of admission. Channel Islands Maritime Museum offers free admission on the 3rd Thursday of each month. U.S. Navy Seabee Museum in Port Hueneme offers year-round free admission. 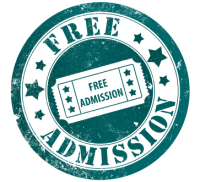 Free admission at the Museum of Ventura County in Downtown Ventura the 1st Sunday of the month. Free First Saturdays from 11am to 4pm at Studio Channel Islands Art Center in Old Town Camarillo. There is no admission charge at the Pleasant Valley Historical Museum and Botanical Garden in Camarillo. Open weekends. There is no charge for looking through the windows into the A.J. Comstock Fire Museum in the Figueroa Street Mall in Downtown Ventura. Ojai Valley Museum currently offers free admission the 3rd Friday of each month from 5:30-7:30pm. Museum of Ventura County’s Agriculture Museum in Santa Paula offers free admission on the 1st Sunday of the month. Santa Paula Art Museum offers free admission on the 1st Sunday of the month. Aviation Museum of Santa Paula is open the 1st Sunday of each month with no admission charge. California Oil Museum in Fillmore is free admission year-round, though there is a suggested donation of $4. Admission is free year-round at the Reagan Ranch Center Exhibit Galleries in Santa Barbara on State Street in front of the Amtrak Station. Santa Barbara Historical Museum offers free admission year-round; donations are welcomed. Free Family Days at the Santa Barbara Museum of Natural History on the third Sunday of January, February, March, April, September, October, November, and December. Nethercutt Museum in Sylmar offers free admission year-round to its showcase of vintage cars. Griffith Observatory in Los Angeles offers free year-round admission. Kidspace Kids Museum in Pasadena offers Free Family Night from 4pm to 8pm the 1st Tuesday of each month, except September. The Getty Villa in Pacific Palisades is free of charge year-round. California ScienCenter in Exposition Park is free admission year-round. Bank of America offers free admission to over 150 museums around the country the first full weekend of each month. 1956 Rolls Royce Phantom Saloon at Nethercutt Automotive Museum. You like FREE!? Click here for hundreds of other free activities and things in and around Ventura County!